At a press conference , Microsoft’s CEO Steve Balmer officially unveiled its new Windows Phone 7 operating system for mobile devices, along with nine smartphones by various manufacturers that will carry the software upon its release. 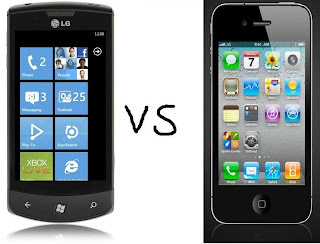 Together with Android devices, smartphones running Windows Phone 7 will be one of the biggest competitors to the iPhone 4 running iOS, so how do the new devices compare to Apple’s already massively popular iPhone? So that’s how the technical specifications square up to each other. Microsoft has tapped up Dell, HTC, LG, and Samsung to make the hardware for the first of the Windows Phone 7 devices, and as far as performance goes, each device is pretty similar. The processors are all around the 1GHz mark, and each run 512MB of RAM. The camera and video recording capabilities of the iPhone and Windows devices are also very much alike: apart from the HTC 7 Mozart which boasts an 8MP camera, the rest of the Windows Phone 7 launch clan sport a 5MP camera with 720p video recording – just like the iPhone 4. None of the Windows devices have a screen that comes close to the iPhone’s Retina display, but a couple do have physical qwerty keyboards, which will please the likes of Blackberry users who are used to having buttons. You also won’t find a gyroscope in any of the Windows devices, so those that have been impressed with them in the new iPhone will be disappointed. So what about software? Video demos of Windows Phone 7 in action certainly seem to be pretty impressive, with a fresh, intuitive user interface, greatly improving upon its predecessors. But it’s unclear at this early whether it will be any match for iOS. To compare the operating systems, we’ve highlighted some of the standout areas below. Windows Phone 7 won’t support multitasking to begin with, a feature that iOS users waited forever for. Just like it did with iOS, however, multitasking may find it’s way on to Windows devices in a future update. Windows Phone 7 users will use Microsoft’s Zune media player for their music and movies, and the Zune software for PC to sync their media to their handset. This competes with the fantastic iPod application iOS users love, and the iTunes software for Mac and PC that – faults aside – does a pretty good job of syncing everything we want to our iPhones. We’re all familiar with the fantastic Safari and Mail applications built in to iOS; both of which are a great example of how internet and email should be handled on a mobile device. Safari features intuitive touch controls and the ability to save your bookmarks to your home screen, whilst Mail boasts a unified inbox and message threading. Windows Phone 7 comes with Internet Explorer Mobile, which boasts tabbed browsing and touch controls much like Safari. It also has Outlook Mobile built-in for email which features streamlined account setup for Windows Live, Google, and Yahoo mail accounts, as well as multiple Exchange accounts. Unlike the iPhone, Windows Phone 7 devices don’t currently support internet tethering. However, just like multitasking, this came in a future update to iOS, and the same could happen for Windows. I’m sure you’ll already be aware that the iPhone doesn’t support Adobe’s Flash player, and to begin with, Windows Phone 7 won’t either. The Camera app for iOS is great for taking quick snaps while you’re on the move, which you can then sync to your computer, send to friends via email or MMS, or upload to your MobileMe gallery. Windows Phone 7 features a “Pictures Hub” which, much like camera roll on iOS, houses your entire picture collection in one place. As well as syncing them to your PC and sending them to your friends, you can also upload your pictures directly to Facebook or Windows Live. Of course, Microsoft have their own App Store for their Windows Phone 7 devices, called “Marketplace.” Only time will tell whether the Marketplace will become as popular as the App Store with regards to the number of quality apps and games available, but big name developers like EA have already committed to developing games for Win7 devices. And with Xbox Live built-in for online gaming, it’s certainly on the right tracks. Microsoft have their own Office applications built-in, including mobile versions of Word, Excel, OneNote and Powerpoint. Although iOS doesn’t yet boast Apple’s own office applications for the iPhone, there are plenty of third-party office suites available. On launch, Windows Phone 7 devices will be available in 30 countries on 60 cell phone operators. In the U.S., Windows devices will be available on 3 networks including AT&T and T-Mobile, and 7 carriers in Europe including Orange, Vodafone, and O2. Conclusion and the final verdict !! As a huge fan of the iPhone and iOS, I hate to admit that Windows Phone 7 looks pretty impressive. Compared to its Windows Mobile predecessors, it’s a huge improvement; the software looks clean and intuitive and really nice to use. But at this point it’s hard to say whether it’ll be anywhere near as good as iOS. The same goes for the hardware: some of the Windows Phone 7 launch devices look pretty great and provide features that many people find the lacking in the iPhone, like a physical keyboard. However, none of them seem to beat the iPhone 4, and they’re nowhere near as gorgeous.